ALL finds a new home in the historic Gates Building at 307 Market St. Photos by Tory Germann. In the reaches of a historic manufacturing block, where the whir and clank of machines once hummed, new life is buzzing as a diverse mix of artists prepare to launch Lowell’s newest creative space. 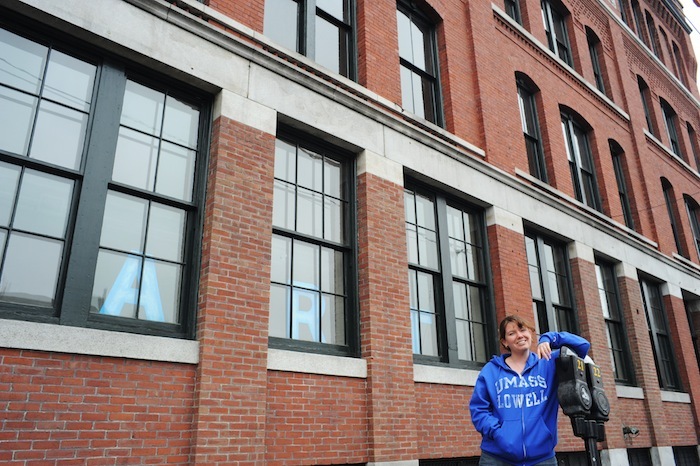 After almost a decade of surfing from one downtown location to the next, The Arts League of Lowell (ALL) has found a place to call home at 307 Market St., in the renovated 1881 Gates Building. On May 11, the new ALL Arts Center will celebrate its grand opening with 30 artists showcasing their work in a lofty room with plenty of natural light, hardwood floors and creativity bursting from every crevice and corner. From painting and polishing floors to cleaning windows, members of the co-op have labored over their new home, which they hope will eventually serve as a popular destination spot for classes, workshops and special events besides a place for finding and purchasing original art. The space after all, is the offspring of a group of artists who established the cooperative in 2004 to share the cost of maintaining a studio. But finding a permanent place to set up shop has been a challenge from the word “go,” says Steve Syverson, ALL president and chairman of the nonprofit’s board of directors. Steve Syverson relocated his art supply store, Van Gogh’s Gear, to 307 Market next door to ALL’s new Arts Center. The co-op has moved seven times over the years, putting in its longest residency at the former Revolving Museum on Shattuck St. before the museum moved. ALL’s landlord, Developer Nicholas Sarris, began construction on the historic “Gates Block” last spring, wanting to carve out more space for affordably priced artist studios in downtown. The ALL Arts Center adds another link in the city’s blooming artist district. In 2005, the mill-turned-art-complex near downtown known as Western Avenue Studios, opened with 31 studios. Today there’s about 300. Last year, The Zeitgeist Gallery opened on Market Street and venues like 119 Gallery and UnchARTed Studios draw a large crowd of 20-somethings with revolving art shows and live music performances. Veteran haunts like the Brush Gallery and the Whistler House Museum have kept foot traffic coming and anticipation grows for the arrival of even more creative spaces, including Mill No. 5 on 250 Jackson St., which will combine independent retailers, a movie theater, farm-to-table cafe and, yes, plenty of affordable studio space. Affordability, says Gavin, is the magic word. The ALL Arts Center filled up fast with members of the co-op paying an average of about $30 per month to display a wide range of artwork and media including photography, sculpture, painting, jewelry, pottery and more. To learn more about the ALL Arts Center, visit thier website here, and like them on Facebook. ALL’s Indiegogo fundraiser is in full swing to help the gallery raise money for lighting and other finishing touches. To help bring more art to Lowell click here.